How to send an email from command line or script? I want to be able to run the script programmatically by passing the receiver and the message. There are two programs that I am aware of which will easily allow you to configure your Mac to send email from the command line. Of the two, I suggest msmtp. # this next line is crucial: you have to point to the correct security certificate for GMail. Note that tls_trust_file line should point to wherever you have downloaded and installed the certificates from https://www.thawte.com/roots/index.html. I put mine in ~/Dropbox/Thawte Roots so that I can have it on all of my Macs. I think that covers most of the details. See http://www.tuaw.com/2010/05/04/msmtp-a-free-tool-to-send-email-from-terminal/ if you want a few more specifics. The most basic way to send mail is trough a telnet session with the smtp server of your provider/network. After you contacted the server and after every command the server will answer if it accepts the command with something like "250 OK", or if not with an error message. All details can be found in RFC2821 - Simple Mail Transfer Protocol, Google for it. This basic way is great for testing why something goes wrong sending mail, but I think it's quite complicated to script it full proof. First get an command-line interface on your computer, by starting Terminal. Then continue with the following commands, one after one. 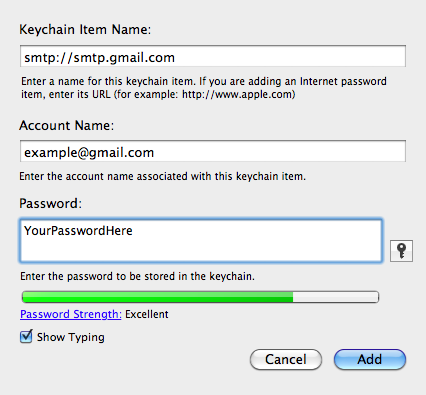 mtcmail is another option: http://www.macupdate.com/app/mac/33505/mtcmail-cli. You may want to check out postfixconf that enables and configures OS X to send emails from the command line (using your input). It is based on the postfix configuration that are well documented on the web here, here and here. Since it's Unix based, you can use sendmail command. Not the answer you're looking for? Browse other questions tagged email development command-line script . Send email from my ipad without receiving? Darwin/Linux/Unix command line email client that supports iCloud? How to prevent Mac sleep from command line? How can I send an email from within iCloud.com using a different email address?